The president of Asse,and their management, decided to close the sector of Green Angels(2000fans) for this game, after following incident during the derby Lyon-Asse, last week, and after that this group used a lot of Pyro during the Final Cup, 3days before. The LFP(League Football Professional), no condamn Asse for the moment. 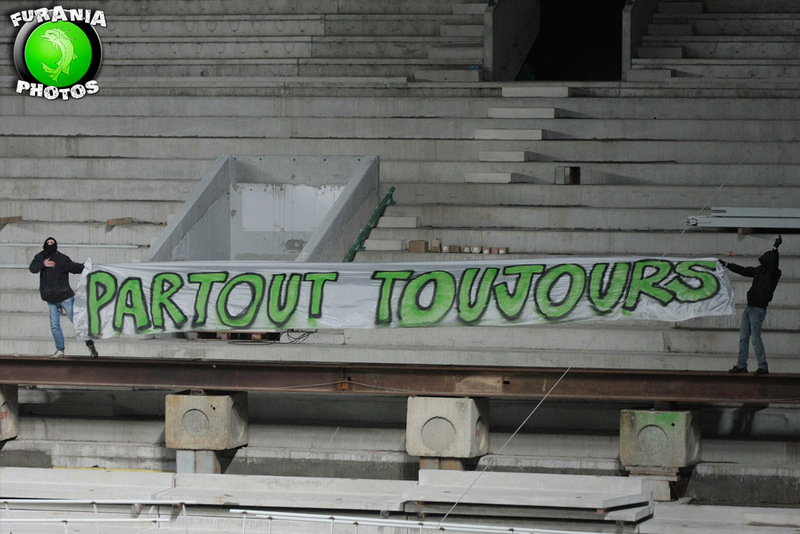 So, it's the Club of Asse who decided to condamn their own supporters,in their own stadium. After this act, Green Angels decided to stop their activties for an indefinite period. Side Kop Nord, Magic Fans decided to stop their activities too, for an indefinite period too. Ultras Fans of Saint-Etienne decided to enter in Resist against the Club,the LFP,etc, for indefinite period, to protest against a huge Repression, and in order to save their own liberty for support their team.